356 / 1500 (B4 cyl, 1488 ccm, 60 PS; wb: 2100 mm) - end of prod. Pierwsza modernizacja nadwozia: jednoczęściowa szyba przednia, krótszy zderzak zaopatrzony w "kły", okrągłe lampy tylne. Wiosną przeznaczony na rynek USA America Roadster ważący tylko 605 kg, na życzenie importera wyłącznie jako 1500 S. Powstało 15 egzemplarzy zbudowanych przez Reuttera. 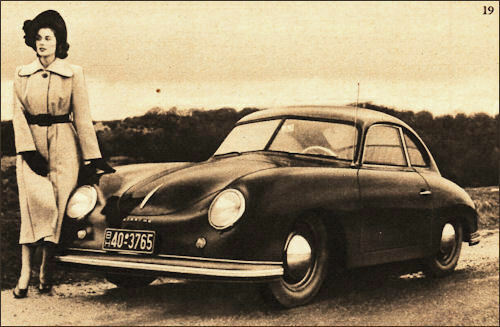 The Porsche 1130-c.c. air-cooled 40-h.p. flat four power unit which, with a bore and stroke of 75 x 64 mm., is dimensionally identical with the Volkswagen, has been replaced by a type which comes just within the 1100-c.c. class with dimensions of 73.5 x 64 mm. This in turn is supplemented by a 1.3-litre model (80 x 64 mm.) developing 44 h.p. and a 1½-litre model (80 x 74 mm.) which, in its most highly developed form, gives 70 h.p. at 5,000 r.p.m. All of these engines now have light alloy cylinders with chromium-plated cylinder bores and in order to avoid a foul within the standard Volkswagen crankcase the long stroke models have one-piece connecting rods with a roller bearing and a Hirth built-up crankshaft. 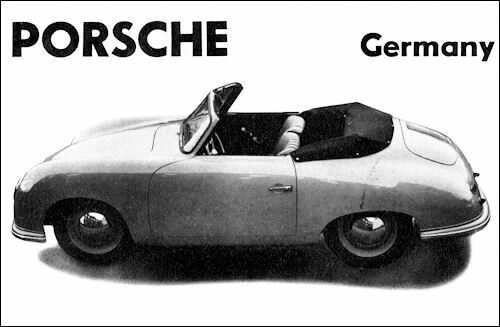 Being based on the Volkswagen so far as mechanical elements are concerned, all the Porsche cars heretofore constructed have had a four-speed gearbox with no synchromesh mechanism. The Porsche organization itself has, however, been closely concerned with alternative schemes for quick and fool-proof gear engagement, one such having been described in the appraisal of the Cisitalia Formula I Grand Prix car which appeared in The Motor of August 6, 1952. 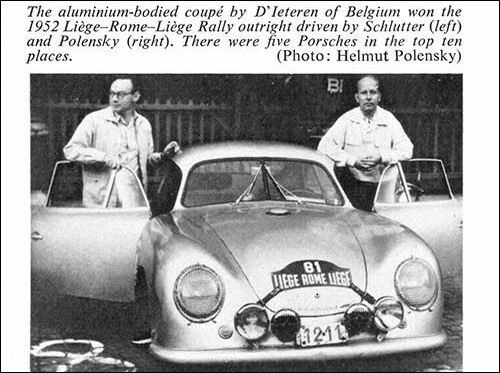 At the Paris Show of this year it was announced that all future Porsche models would be fitted with full synchromesh on all four forward speeds, but that a new system had been evolved in which there was a considerable saving of space as compared with the conventional cone arrangement, in substitute for which Porsche uses split rings of chrome molybdenum steel having a width of only 8 mm. or approximately ¼ in. These rings have a chamfer on one face, and they take up so little space that the fully synchronized set of four speeds can be fitted into the gear case originally designed for the unsynchronized gears. What is more, the effect of these split synchronizing rings is so powerful that bottom gear, upon which the 1.1-litre Porsche car will reach nearly 30 m.p.h., can be instantly engaged - a point of particular importance when approaching hairpin bends in mountainous country. Second, third, and top ratios are plotted to give road speeds of 48, 75, and 104 m.p.h. at 5,000 r.p.m. The combination of excellent shape and low frontal area on the Porsche gives an altogether remarkable relationship of maximum speed to engine output, very nearly 100 m.p.h. being obtainable from 55 h.p. 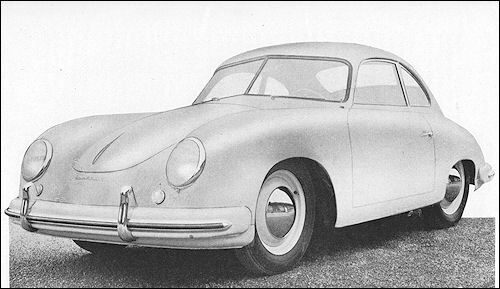 REALLY AERODYNAMIC: The rear-engined air-cooled Porsche has possibly the lowest coefficient of penetration of any production car, and is at the same time a thoroughly practical two-seater Coupé with ample visibility, as shown here.